Last week I threw a small dinner party for some of my girlfriends. Whenever I entertain I always like to use fresh flowers. The flower options at the local grocery stores here aren't great but they always have $4 bouquets of this type of flower. I can't remember what these are called now but I love them. They come in various colors and have some major staying power. We even used these in some of our wedding arrangements. The flowers here are already almost a week old and they are still holding strong. I was able to break down the bouquet into 3 small vases. I always love finding unique vases other than the traditional and expected. The vases here are actually a jam jar and a spice jar - the glass ones from Whole Foods, they make perfect vases. Not bad for $4 flowers! Nothing makes me happier than fresh flowers around the house. 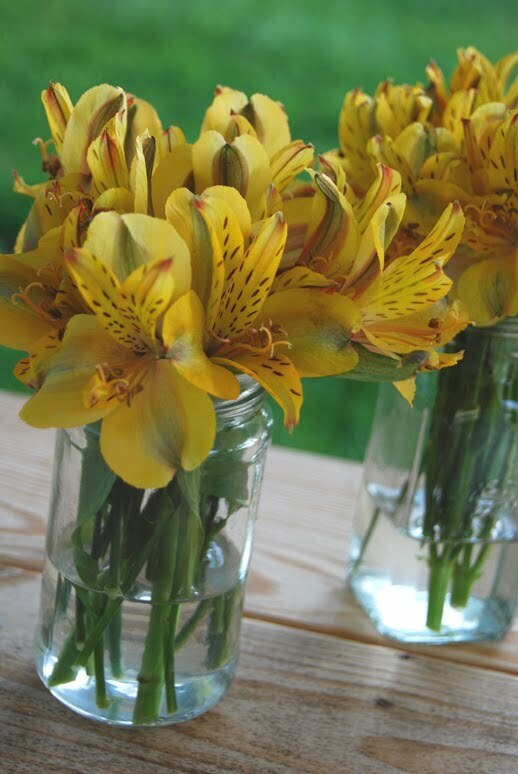 They turned out very pretty... they are called alstromeria lilies. Thank you! I knew someone would know what they were called! !